This post is by Dillon Blankenship, one of our Hubbard Fellows. Though I came into the Hubbard Fellowship to learn about restoration and conservation of prairies, I have had the good fortune to spend a fair amount of time in, associated with, or, at least, thinking about stream and river systems too. Most of these experiences have been of the Platte River – from surveying for mussels in a southern braid to visiting the various dams, diversions and other irrigation structures that utilize its mighty flow. 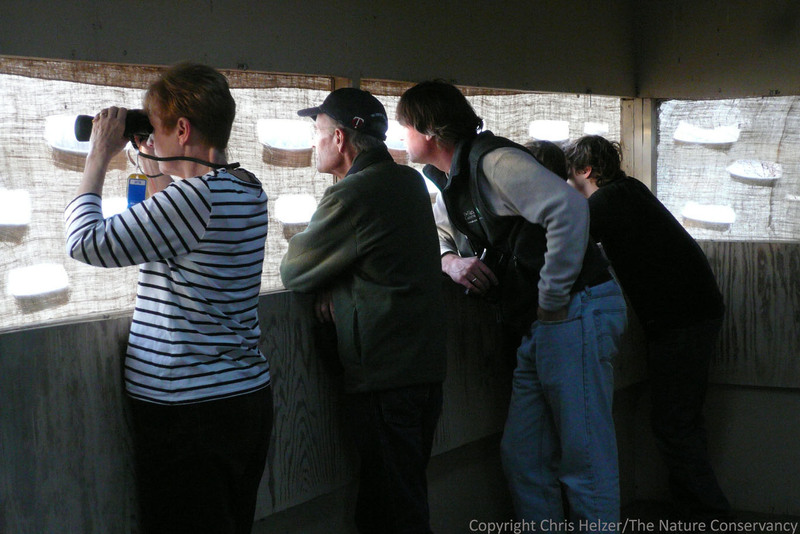 Oh, and of course, how about the bazillion hours shared with roosting sandhill cranes and awestruck visitors in riverside blinds this spring! The Central Platte River near Wood River, Nebraska. Even when my work does not lead me there, the Platte is inescapable – I drive across it to go just about anywhere and often parallel it for miles on end (who is following who?) as I journey across the state. It is also a persisting reference point and a comforting explanation for some of the tree lines I see from Interstate 80. Its associated groundwater makes possible our impressively realized agricultural potential and supports a great diversity of plants and wildlife. Here is a good map of the extent of the Platte Watershed – http://en.wikipedia.org/wiki/Platte_River#/media/File:Platterivermap.jpg – which I see in the embodiment of the Platte River itself, but is much more expansive than a single waterway. 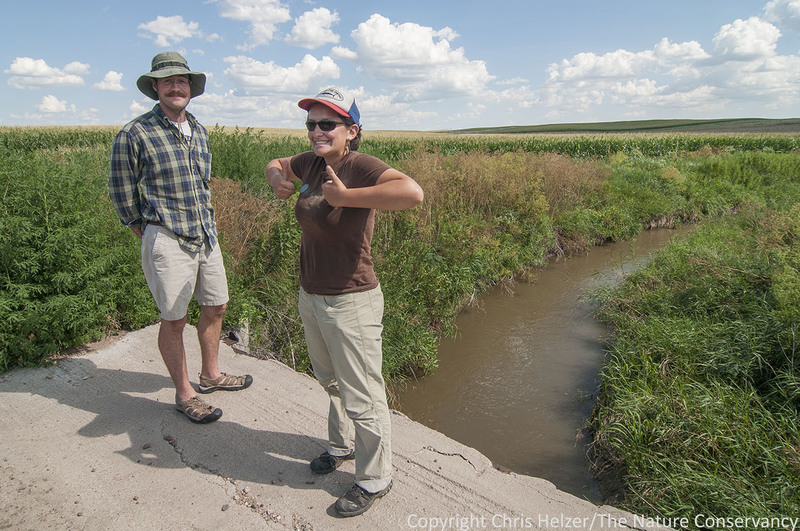 Hubbard Fellows Dillon Blankenship (left) and Jasmine Cutter stand near an irrigation ditch while on a tour to learn about irrigated agriculture and the Platte River. I mention this on The Prairie Ecologist blog now because I am feeling particularly inspired to appreciate my watershed today. I’ve been doing an online course concerning water issues in the western United States that has had me thinking a lot about where my water comes from – which, thankfully, is plentiful enough from its origins in the Rockies to me and on to the Missouri that I don’t have to borrow from watersheds beyond my own. It has also illuminated the complexity of how we allocate water resources to satisfy interests across state boundaries (Colorado, Wyoming, and Nebraska for the Platte) and has altogether inspired a deeper appreciation for this vital fluid’s movement across the landscape. Of course, The Prairie Ecologist blog community is a diverse crowd when it comes to geography, so I expect many of you to be intrinsically tied to rivers and watersheds beyond the Platte and that is great! Some of your attachments must be physical – you live on them and in them and they, quite literally, are a part of you. However, I also suspect you have been affected by water systems in nonmaterial ways– the memory of a family canoeing trip (or “tanking” excursion if you are Nebraskan), the viewing of an inspiring water-related natural spectacle, or the comfort of a secret fishing spot for contemplation and big catfish. Many people’s strongest personal connection with the Platte River comes from watching migratory sandhill cranes in the spring. Despite being a Platte River patron – and to some extent a lover of the Loup and a Niobrara nut – I also feel the pull of waters from previous, far-off stations (Oregon’s Willamette River, the Buffalo River of Arkansas…) and am excited to be shaped by whichever watersheds I call home in the future. *Urrea, Luis Alberto. Wandering Time. Tucson: University of Arizona Press, 1999. Print. 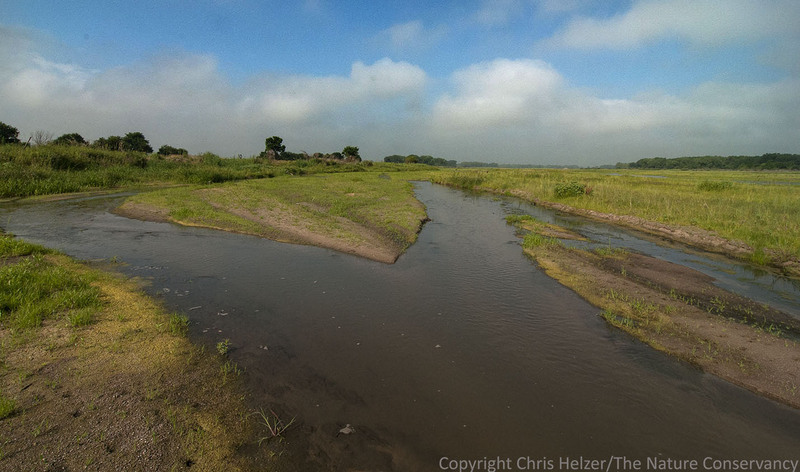 This entry was posted in Hubbard Fellowship and tagged connections, dillon blankenship, hubbard fellow, hubbard fellowship, nebraska, platte river, platte river prairies, reflections, the nature conservancy by Chris Helzer. Bookmark the permalink. I’d rather not mention the name of my river. But a few years back my Midwestern city started using water from the river because our wells weren’t producing as well as they used to. That bothered me, but what bothered me more was the fact that it didn’t seem to bother anyone else. Conserving water is a good idea wherever you are. Smoky Hill River east of Lindsborg, KS. That book of Luis’s is a favorite of mine, and you picked out a great quote. His words and others have inspired me to think about my own watery connections. I often feel, as another great writer phrased it, “haunted by waters.” But the exact proportions of what is haunting me are a little harder to come by. Currently, I think of my watershed address as Dry Run-Kickapoo Creek-Illinois River-Mississippi River-Gulf of Mexico-Atlantic Ocean. This relatively hard to love neighborhood that I find myself in has needled and almost taunted me into exploring it in one form or another. Though somewhat reluctant at first, it is through those explorations that I have come to appreciate and respect these waters, as well as want to protect them. Like you, though, I have had other liquid relationships before. The Arkansas floats across my mind and serves as a warehouse of historical lessons and stories. Whenever it really rains, I think of the glorified sewer drain that ran through my development growing up and our floats down it in the wake of storms. The waters of northern New Mexico are inescapable in my thoughts as well: the Embudo as it flows by down the street from Stan Crawford’s place, the Rio Grande running strong in spring through the Burq, the many acequias dotting the landscape and still waters that sustain culture and community, the trickle that is – sometimes – the Santa Fe, the San Antonio wetlands on the Valles Caldera, and on and on through that beautiful and tragic region. I could continue interminably about other land-bound waters I have known, but it is saltwater that must make up the vast majority of that two-thirds of me. For wherever I am, whatever lovely watershed I find myself in, I am still, always, thinking about the sea. Its vastness seems to invite dreams of limitless possibilities, which have always been its great allure and also its Achilles heal. For it is hard enough to get people to protect and cherish something that is so intimately familiar and apparently finite as a backyard creek, but the seemingly unending expanse of the oceans provides a further impediment to meaningful and holistic appreciation and action. Enjoy the Platte, Dillon. Looking forward to more of your musings. Well said, Jeff. Thanks for sharing! I am definitely excited to further explore Urrea’s bibliography – glad to know that you approve. Annie Dillard’s notes from Tinker Creek have been another inspiration. Regarding the Arkansas, I am still impressed with your getting us aboard that yachting flotilla (2011ish). Emily and I have both reflected on this event and neither is sure that it actually happened. Best wishes. Dry Creek (a tributary of the Chipola River, North Florida), the Hiwassee in Tennessee, the Cahaba in Alabama, the Snake at the Tetons…. Bill, In just a few days I learned SO MUCH from you and Katie. That said, I keep failing with the Woodhead references… I can’t get it out of my head that it isn’t Danny WoodHOUSE, like the toad’s we have on the prairie (http://en.wikipedia.org/wiki/Woodhouse%27s_toad)! Logan plans (and the others you mention) are still in play and I will certainly be looking you up – e-mail in your inbox in a week or so. Thanks for commenting! The Hudson River. It was the watershed of my early youth. There’s a reason it was the inspiration for a whole school of American art. And the the Buffalo bayou, a little later in my growing up, that ran through my yard in Houston is another favorite! Frogs, snakes, turtles, crawdads, and all other sorts of fun critters. Speaking of crawdads, you oughrta ask Rich about the time I found a crawdad in the irrigation ditch pictured in this post. Actually, John’s version is probably more entertaining. Weaving waters that fill two thirds of my body include the lakes around the Mitten state. More recently the Niobrara weaves its way along with the Minnechaduza. I’m always fascinated by the wildlife, aquatic life – including plants – that call these waterways home. Michigan has a diverse shoreline which has some of the prettiest rocks, something I miss terribly. Beautifully written, Dillon. Please keep ’em coming. I guess the Colorado River and the Brazos River are mine here in Texas. One I grew up near, and still visit occasionally. The other I am bounded by in my work as every County I work in is either apart of it or it’s many tributaries. They play a vital role and are being over allocated to serve the growing urban needs even over and above the historical agricultural allocation for rice along the TX coast previously. I’m two thirds the aquifer beneath me! Although the lake across the street is in me in a different way… In my town in MA everyone has a well, and although I’m not very well educated, I believe that our aquifer out here in the east is healthily replenishing itself with new pure water. My 2/3 must be split into many pieces. The largest part is River des Peres. This ‘River of the Fathers’ and it tributaries flow through the city of St. Louis and the inner suburbs outside of the city. It was named for the French missionary priests who came to the area near the mouth of the River (where it joins the might Mississippi, south of the city) in 1700 and befriended the Kaskaskia natives who lived there. Once touted for the healing properties of its sulfur springs, the River des Peres is now lined with signs warning of dangers and health risks. We have treated the River poorly, with a history of pouring concrete, sewage, industrial waste, and goodness knows what else into the River. There is a dedicated group of individuals and organizations who are doing what they can to cleanse and beautify the River, but it is a long, slow journey. The River des Peres is where I go to make a difference; to work at restoring the natural beauty that has been forgotten (but certainly not lost). The next largest portions belong to the lower Missouri River and Meramec River (yes, I spelled it right; you are thinking of a different river). These are the waters in Missouri where I paddle. Many people fear paddling in the Missouri. It is a large, powerful river, capable of ripping trees from the ground and homes from their foundations. But when you are on the Missouri River, it is slow and wide. It carries and cradles you. You can travel at leisure or compete in any number of races, as long as you are wary of barges and bridges. On the other hand, the Meramec River is where everyone and their brother goes to paddle. Any summer weekend, you will find rafts of (mostly) inexperienced floaters, and kayaks and canoes with paddlers of all ages and experience levels. I sometimes float the Meramec on weeknights or in the off-season to enjoy peace and solitude. But in all seasons, both the Missouri and the Meramec remind me of the power, beauty, and importance of flowing, life-giving water. They recharge my spirit so that I can continue working to restore the stream and riparian habitats in and along the River des Peres. There are many other waters that have a few drops of me: lakes and streams I have visited, or fished in, or paddled. There are even a few that I’ve never seen that can claim a bit; rivers that are cleaned or protected by friends I’ve met along my own journey. Those rivers are a part of my friends, and those friends are a part of me; and we all flow together. Red Rock Creek into the Ninnescah River into the Arkansas River and so on. Not drinking river water here but others do downstream. High Plains aquifer is the source for our tap.